There are flea markets all across Florida, and this was not the worst of them. It had once been an aircraft hangar, but the local airport had closed. There were a hundred traders there, behind their metal tables, most of them selling counterfeit merchandise: sunglasses or watches or bags or belts. There was an African family selling carved wooden animals, and behind them a loud, blowsy woman named (I cannot forget the name) Charity Parrot sold coverless paperback books, and old pulp magazines, the paper browned and crumbling, and beside her, in the corner, a Mexican woman whose name I never knew sold film posters and curling film stills. I bought books from Charity Parrot, sometimes. Soon enough the woman with the film posters went away and was replaced by a small man in sunglasses, his grey tablecloth spread over the metal table and covered with small carvings. I stopped and examined them—a strange set of creatures, made of grey bone and stone and dark wood—and then I examined him. I wondered if he had been in a ghastly accident, the kind it takes plastic surgery to repair: his face was wrong, the way it sloped, the shape of it. His skin was too pale. His dark hair looked like it had to be a wig, made, perhaps, of dog-fur. His glasses were so dark as to hide his eyes completely. He did not look in any way out of place in a Florida flea market: The tables were all manned by strange people, and strange people shopped there. I bought nothing from him. The next time I was there Charity Parrot had, in her turn, moved on, her place taken by an Indian family who sold hookahs and smoking paraphernalia, but the little man in the dark glasses was still in his corner at the back of the flea market, with his grey cloth. On it were more carvings of creatures. “I do not recognise any of these animals,” I told him. He shook his head. You cannot ask anyone in a flea market where they get their stuff from. There are few things that are taboo in a flea market, but that is: Sources are inviolate. There was a chiming noise, then, to signal that soon enough the flea market would close. “Would you like food?” I asked. He looked at me, warily. I waited at Denny’s. After half an hour I no longer expected him to come, but he surprised me, and he arrived fifty minutes after I got there, carrying a brown leather bag tied to his wrist with a long piece of twine. I imagined it had to contain money, for it hung as if empty, and could not have held his stock. Soon enough he was eating his way through a plate piled with pancakes, and, over coffee, he began to talk. The sun began to go out a little after midday. A flicker, first, and then a rapid darkening that began on one side of the sun and then crept across its crimson face until the sun went black, like a coal knocked from a fire, and night returned to the world. Balthasar the Tardy hurried down from the hill, leaving his nets in the trees, uninspected and unemptied. He uttered no words, conserving his breath, moving as fast as befitted his remarkable bulk, until he reached the bottom of the hill and the front door of his one-room cottage. “Oaf! It is time!” he called. Then he knelt and lit a fish-oil lamp, which sputtered and stank and burned with a fitful orange flame. The door of the cottage opened and Balthasar’s son emerged. The son was a little taller than his father, and much thinner, and was beardless. The youth had been named after his grandfather, and while his grandfather had lived the boy had been known as Farfal the Younger; now he was referred to, even to his face, as Farfal the Unfortunate. If he brought home a laying-fowl it would cease to give eggs, if he took an axe to a tree it would fall in a place that would cause the greatest inconvenience and the least possible good; if he found a trove of ancient treasure, half-buried in a locked box at the edge of a field, the key to the box would break off as he turned it, leaving only a faint echo of song on the air, as if of a distant choir, and the box would dissolve to sand. Young women upon whom he fastened his affections would fall in love with other men, or be transformed into grues or carried off by deodands. It was the way of things. “Sun’s gone out,” said Balthasar the Tardy to his son. It was chillier, now the sun had gone out. Balthasar said only, “It soon will be. We have only a handful of minutes left. It is well that I have made provision for this day.” He held the fish-oil lamp up high, and walked back into the cottage. Farfal followed his father into the tiny dwelling, which consisted of one large room and, at the far end of the dwelling, a locked door. It was to this door that Balthasar walked. He put down the lamp in front of it, took a key from around his neck and unlocked the door. “Idiot boy,” said his father. “Go through, and tread carefully as you do.” And then, when Farfal made no move to walk, his father pushed him through the door, and closed it behind them. Farfal stood there, blinking at the unaccustomed light. Balthasar the Tardy began then to remove his clothes of dark sacking until he was naked, a fat man with a long white beard and cropped white hair, and then to cover himself with brightly-coloured silken robes. “There is wealth?” asked Farfal, looking at the room he was in with fresh eyes. He had spent his life in a one-roomed cottage at the end of time, at the bottom of a small hill, surviving on the food his father could net in the air—usually only seabirds or flying lizards, although on occasion other things had been caught in them: creatures who claimed to be angels, or great self-important cockroach-like creatures with high metal crowns, or huge bronze-coloured jellies. They would be taken from the netting, and then either thrown back into the air, or eaten, or traded with the few folk that passed that way. He covered the casement with a piece of woven cloth, which made it less remarkable that a large wooden casement was standing, unsupported, in the centre of a room. Balthasar the Tardy left that room through a door that Farfal had not previously observed. Bolts were slammed closed. Farfal picked up his rag, and began, wanly, to dust and to polish. After several hours he observed a light coming through the casement, so brightly as to penetrate the cloth covering, but it soon faded once more. Farfal was introduced to the household of Balthasar the Canny as a new servant. He observed Balthasar’s five sons and his seven concubines (although he was not permitted to speak to them), was introduced to the House-Carl, who held the keys, and the maidmen who hurried and scurried thence and hither at the House-Carl’s command, and than whom there was nothing lower in that place, save for Farfal himself. The maidmen resented Farfal, with his pale skin, for he was the only one apart from their master permitted in the Sanctum Sanctorum, Master Balthasar’s room of wonders, a place to which Master Balthasar had hitherto only repaired alone. And so the days went by, and the weeks, and Farfal ceased to marvel at the bright orange-red sun, so huge and remarkable, or at the colours of the daytime sky (predominantly salmon and mauve), or at the ships that would arrive in the ship-market from distant worlds bearing their cargo of wonders. Farfal the Unfortunate bit his lower lip to keep from replying. From the courtyard there came a cry. “Balthasar? Wretch! Cheat! Liar! Where are my thirty stones?” The voice was deep and penetrating. “I shall treat you much better in the future,” said his father. “I swear it.” He walked to the casement, pulled off the cloth. There was no light to be seen through it, nothing inside the wooden casing but a deep and formless blackness. Then he removed the sluggish spell-creature he had placed on the casement as a lock, and he pushed against the inner casing, which opened slowly. A chill wind came through it, which made Farfal shiver. “You send us to our deaths, father,” he said. “Do I go first?” asked Farfal, clutching the bag. In reply his father prodded him in the back with a hard finger. Farfal clambered, grumbling, through the casement, and his father followed. “This is too bad,” said Farfal. They walked out of the cottage at the end of time and Farfal bent to pick up pebbles. He placed the first in the bag, where it glinted greenly. He picked up another. The sky was dark but it seemed as if something filled the sky, something without shape. There was a flash of something not unlike lightning, and in it he could see his father hauling in nets from the trees at the top of the hill. There was a powerful wind then, and Farfal watched his father crackle, and then raise into the air, and then vanish. He backed away from the Nothing, a darkness within the darkness with tiny lightnings playing at its edges, and then he turned and ran, into the house, and through the door into the second room. But he did not go through into the second room. He stood there in the doorway, and then turned back to the Dying Earth. Farfal the Unfortunate watched as the Nothing took the outer walls and the distant hills and the skies, and then he watched, unblinking as Nothing swallowed the cold sun, watched until there was nothing left but a dark formlessness that pulled at him, as if restless to be done with it all. Only then did Farfal walk into the inner room in the cottage, into his father’s inner sanctum a million years before. A bang on the outer door. Farfal glanced around the room. The only window was too small to permit him to climb out, while the room’s only door had Luthius Limn on the other side of it. “Unfortunate indeed,” he sighed. Then he took the bag his father had given to him and swept into it all the trinkets, oddments and gewgaws he could reach, still taking care not to touch the green flute with his bare flesh. They vanished into the bag, which weighed no more and seemed no more full than it had ever done. He stared at the casement in the centre of the room. The only way out, and it led to Nothing, to the end of everything. “Enough!” came the voice from beyond the door. “My patience is at an end, Balthasar. My cooks shall fry your internal organs tonight.” There came a loud crunching against the door, as if of something hard and heavy being slammed against it. Then there was a scream, and then silence. Farfal was unfortunate, but not stupid. He lifted down the black lacquer box from the nail upon which his father had hung it. He heard something scuttle and move inside it. “My father told me not to move the casement,” he said to himself. Then he put his shoulder against it and heaved violently, pushing the heavy thing almost half an inch. The darkness that filled the casement began to change, and it filled with a pearl-grey light. He hung the box about his neck. “It is good enough,” said Farfal the Unfortunate, and, as something slammed against the wall of the room he took a strip of cloth and tied the bag that contained all the remaining treasures of Balthasar the Canny about his left wrist, and he pushed himself through. And there was light, so bright that he closed his eyes, and walked through the casement. He flailed in the air, eyes tightly closed against the blinding light, felt the wind whip past him. Something smacked and engulfed him: water, brackish, warm, and Farfal floundered, too surprised to breathe. Then he surfaced, his head breaking water, and he gulped air. 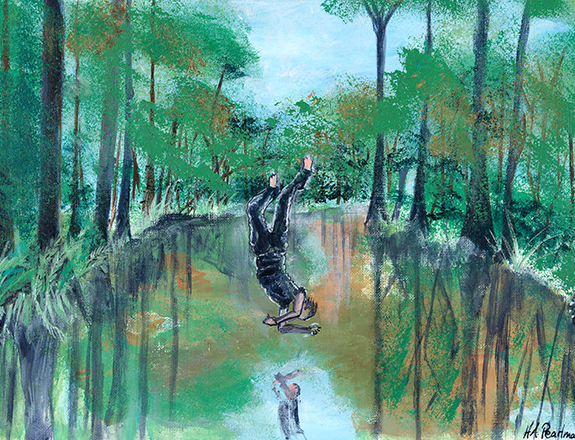 And then he pushed himself through the water, until his hands grasped some kind of plant, and he pulled himself, on hands and feet, out of the green water, and up onto a spongy dry land, trailing and trickling water as he went. He scratched at his neck. Through the opening is his shirt I could see a small, black box, hanging about his neck, no bigger than a locket, and inside the box something moved: a beetle, I thought. But there are big beetles in Florida. They are not uncommon. He got up, then, and walked away, and I sat and stared at the green flute for so long a time; eventually I reached out and felt the coldness of it with my fingertips, and then gently, without daring to blow, or to try to make music from the end of time, I touched the mouthpiece to my lips. © 2009 by Neil Gaiman. Edited by George R. R. Martin & Gardner Dozois. 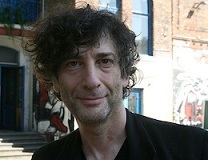 Neil Gaiman’s most recent novel, The Ocean at the End of the Lane, was published in June 2013. His previous novel, the international bestseller The Graveyard Book, won the prestigious Newbery and Carnegie medals, the first author to win both for the same book. Other novels include American Gods, Coraline, Stardust, Neverwhere, and Anansi Boys, among many others. In addition to his novel writing, Gaiman also created and scripted the popular comic book series Sandman. Most of Gaiman’s short work has been collected in the volumes Smoke and Mirrors, Fragile Things, and M is for Magic. He is the winner of four Hugos, two Nebulas, four Stokers, the Carnegie Medal, the World Fantasy Award, and seventeen Locus Awards, among many other honors.